Investigate real-world topics of your choosing from multiple perspectives, which often are different or competing. Learn to collect and analyze information with accuracy and precision, develop arguments based on facts and effectively communicate them. Explore topics such as education, wealth and poverty, or freedom from multiple perspectives (e.g. scientific, economic, political, cultural). Work independently and with a team to research a topic and deliver a multimedia presentation and oral defense. Examine materials like news stories, research studies, and literary works so you can craft arguments to support your point of view and communicate them effectively through the use of various media. You will be assessed through a combination of individual and team projects and presentations as well as through a written exam. 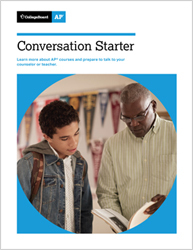 AP Seminar is the first of two courses in the AP Capstone™ program. AP Research is the second course. If you earn scores of 3 or higher in AP Seminar and AP Research and on four additional AP Exams of your choosing, you will receive the AP Capstone Diploma™. This signifies outstanding academic achievement and attainment of college-level academic and research skills. Alternatively, if you earn scores of 3 or higher in AP Seminar and AP Research only, you will receive the AP Seminar and Research Certificate™. Note: AP Seminar is only available to students whose school is participating in the AP Capstone program. Learn more about the AP Capstone program. Interested in Taking AP Seminar? Does our school offer AP Seminar? Visit our AP Seminar page.